Super middleweight contender Franchon Crews Dezurn is still looking to duplicate the success in the professional ranks like she had as an amateur. Crews was a highly decorated amateur, an 8 time national champion, a 4 time national golden gloves champion, plus many other accolades in the amateur ranks. The 31-year-old originally from Virginia, now living and fighting out of Baltimore recently met with boxinginsider to talk about her boxing career, how the transition to the pro game has been, the feeling she had when she lost out on the Olympics despite her amateur success, and her rivalry with Clarissa Shields. “I’m originally from Virginia and I moved to Baltimore around 2001 then I discovered boxing in 2005 on the fly,” Crews said. Franchon originally had aspirations to be a singer and songwriter, but she was aware that image would be an important factor in accomplishing that dream. So she turned to boxing to lose some weight, but would soon discover she was always a fighter at heart. “With my aspirations to be a singer you had to look a certain part, so I was interested in losing weight,” Franchon told me. “I wasn’t like obese or anything but I wasn’t typical pop star material back then. “My mentor at the time told me ‘you know maybe you should lose a little weight,’ and I was in the studio one time and two gentleman who also come to the studio they told me about how you could lose 5 pounds in a day at the boxing gym. “And that sounded very appealing to me and they took me to a gym and I’ve been stuck ever since,” she said. From there she would a spark a very successful amateur career and was considered one of the faces in American’s women’s boxing. However, she would lose out on the Olympics when she was upset by a younger boxing prodigy in Clarissa Shields at the first U.S. Olympic Women’s boxing trials. Franchon was devastated by the defeat, but it did not break her. “It put a damper on me, it bent me out of shape, but it didn’t break me,” Franchon said. “I had to dig down deep and find out who I was with or without boxing. “It was really devastating because you work really hard and to be robbed of the opportunity to even go to the Olympics, it was devastating but it made me who I am. It definitely thickened by skin,” she said. Franchon would later get a chance avenging her amateur defeat to Shields into the professional ranks when she stepped in on short notice to take on Shields in her pro debut. Franchon would lose again to Shields by decision and perhaps it wasn’t the wisest of moves to step in on short notice against Shields, but she’s a risk taker and still believes that one day she will defeat Shields. “I live life on a limb. I’m a risk taker. I want to beat her, I’m going to beat her,” Franchon told me. “But at the time I wasn’t in any shape to be taking that kind of fight. But I know her very well and I know myself and no other girls would step up. “I just stepped up and I know what I can do, I believe in myself. I really want a rematch,” Franchon said. Franchon would go on to win her next three bouts in dominate fashion, but had a brief retirement from the sport just last December as she would grow tired of the politics of the sport. She would later sign with Salita promotions and had a good opportunity fighting on a shobox undercard. However, her stint with Salita promotions was short lived and is now a free agent. “Right now I’m keeping my options open and I know in November I’ll possibly be fighting. I would love to fight before then, but right now I’m focusing on me and getting my conditioning together,” Franchon said. “Since I been a pro I haven’t had an opportunity to be in the best shape ever. I’m just taking a time out and getting my business together, so I can jump back out there,” she said. 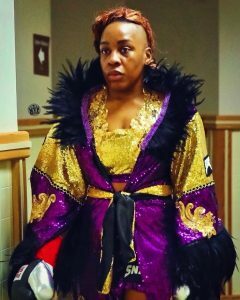 Franchon is itching to get back in the ring as she still wants to accomplish a lot in this sport that includes beating the best of the best around her weight class, to compete on the same card as her husband who is also a professional fighter, and to continue the fight to advance women’s boxing. “I want to beat the best of best whether it’s a Clarissa or a Hammer whoever claims to be the best, I would love to fight them and beat them,” Franchon told me. “I want to be a world champ. I want to help advance women’s boxing; I want to be a part of that fight. “Tell these girls to stop babysitting belts. I’m down to fight; I want to fight to become world champ, traveling the world and get my shot on TV. Lastly, I want to fight on a card with my husband in the future,” she said.